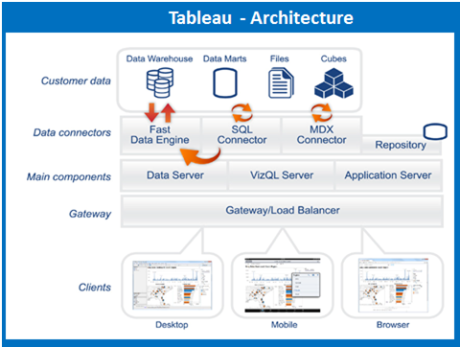 In this portion of the Tableau tutorial you will understand what is the Tableau architecture, understanding the Tableau Server, what is a data layer, data connectors, live connections, in-memory computing and more. 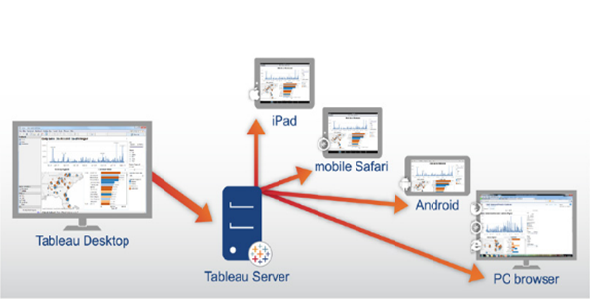 Figure: Tableau provides a scalable solution for creation and delivery of web, mobile and desktop analytics. 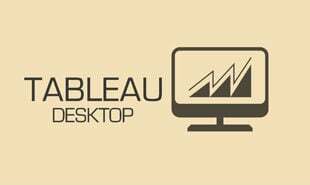 Tableau Server is an enterprise class business analytics platform to level up thousands of clients. Tableau Server presents powerful mobile and browser-based analytics and workings among a company’s presented data strategy and security protocols. 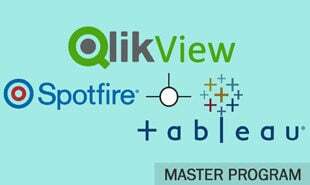 With the right training in Tableau you can go for the best BI jobs in top companies. Figure: Tableau Server architecture supports fast and flexible deployments. Now, we have to explain each of the layers, starting with customer data. One of the basic characteristics of Tableau is to supports your choice of data architecture. It does not need your data to be stocked in any single system, proprietary or otherwise. Nearly all organizations have a heterogeneous data environment, data warehouses live alongside databases and Cubes, and flat files like Excel are still very much in use. You do not have to get the entire data in memory until you choose to. If your existing data platforms are fast and scalable, then it permits you to straightly control your investment by utilizing the power of the database to response problems. If this is not the case, then it provides simple options to improve your data to be fast and responsive with our fast in memory Data Engine. It consists of a amount of optimized data connectors for databases .There are also common ODBC connectors designed for any systems without a native connector. It offers two modes in support of interacting with data: Live connection or In-memory. Clients can switch among a live and in-memory connection as they desire. Live connection: Data connectors of Tableau control your available data infrastructure by transferring dynamic SQL or MDX statements straightly to the source database except importing every data. If you have provided in a quick and analytics optimized database such as Vertica then you get the advantages of that investing by connecting live to your data. This leaves the detail data in the source system and sends the aggregate outcomes of query to Tableau. 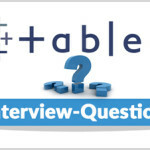 In addition, this means that Tableau can effectively utilize unlimited amounts of data – in fact Tableau is the front-end analytics client to several of the largest databases in the world. 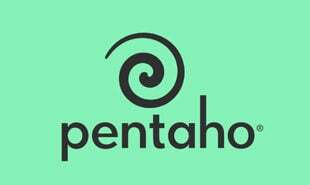 It has optimized every connector to receive advantage of the unique characteristics of every data source. In-memory: It presents a fast, in-memory Data Engine to optimize for analytics. You can connect to your data and after that, with one click, extract your data to get it in-memory in Tableau. 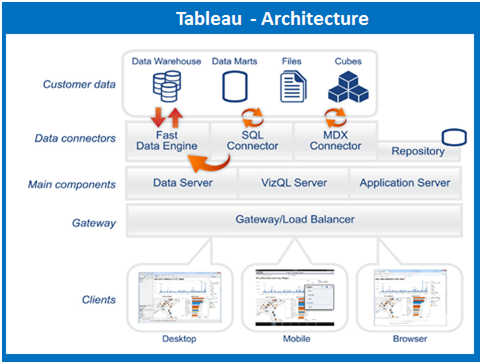 Tableau’s Data Engine fully consumes your entire system to attain fast queries answers on millions of rows of data on commodity hardware. Since the Data Engine can use disk storage as well as RAM and cache memory, it is not confined with the quantity of memory on a system. This is not essential that an entire data set be loaded into memory to attain its performance objectives. 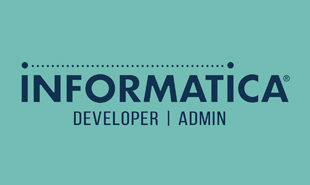 "0 Responses on Tableau Architecture"
Sign Up or Login to view the Free Tableau Architecture.